The UK Guardian has its ‘Brexit Watch’ page, which is regularly updated with commentaries from this and that ‘expert’, purporting to provide a sort of on-going scorecard of what is happening on that front. Many commentaries usually include some statement to the effect that “Brexit is a disaster”. That particular opinion appeared in the header of the most recent ‘Brexit Watch’ update (May 29, 2018) – ‘Brexit is a disaster’ – experts debate the latest economic data – which followed the release by the British Office of National Statistics (ONS) of the – Second estimate of GDP: January to March 2018 (released May 25, 2018) – which showed that the British economy (based on the latest updated data) increased by 0.1 per cent in the first-quarter 2018 and ONS said that “we see a continuation of a pattern of slowing growth, in part reflecting a slowing in the growth of consumer-facing industries”. One contributor to the ‘Brexit Watch’ article (David Blanchflower) had his wind-up ‘Brexit is Bad Doll’ working overtime blaming the Referendum vote and the uncertainty that has followed for the poor GDP performance, particularly the decline in business investment. So if its bad its Brexit is the repeating message. If its good, just wait, it will be bad again soon and then it will be Brexit. That is the repeating message. However, if you read the New York Times article (May 28, 2018) – In Britain, Austerity Is Changing Everything – you get a very different narrative. You can guess which one I think is more accurate. The latest data from the British Office of National Statistics (ONS) show that quarterly growth in real GDP dropped to 0.1 per cent in the March-quarter 2018, down from 0.4 per cent in the December-quarter 2017. The updated data suggests that growth in household consumption expenditure has slowed from the relatively robust 2017 rates, and is now running at a steady, albeit subdued rate of 0.3 per cent per quarter. Is that a surprise, given the massive household debt levels that the British government has been relying on increasing even further to offset the fiscal drag coming from its ongoing austerity. In recent quarters, flat income growth and rising inflation has eaten into the purchasing power of workers, who have been labouring under those record levels of household debt. While private investment fell by 0.2 per cent in the March-quarter, overall gross fixed capital formation rose by a healthy 0.9 per cent as a result of relatively strong government investment spending. The net exports deficit shrunk marginally in the March-quarter as a result of imports falling faster than exports. The ONS located the slowdown in the retail and services sector. 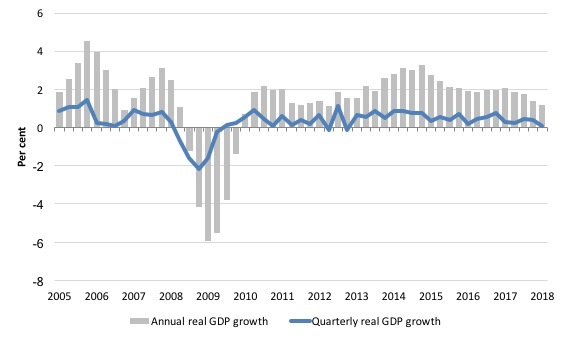 The following graph shows the quarterly and annual growth in British real GDP since the March-quarter 2005 to the March-quarter 2018. David Blanchflower clearly wanted to lump the slowdown together with Brexit. We should expect this decline to continue, which will be bad for British productivity. Recall that the French still produce in four days what the UK produces in five and this is not going to change any time soon. The UK continues to be the sick man of Europe. – “real wages are still 6.5 per cent below where they were in February 2008, just before the great recession started”. Which when you consider the temporality of the phenomenon cited indicates that the vote to Brexit has had nothing much to do with the malaise that the trends in the data are indicating. So why would the Guardian put this commentary under its ‘Brexit Watch’ column rather than in the general Op Ed section where it belongs. For example, I analysed the productivity slump in Britain in this blog post – British productivity slump – all down to George Osborne’s austerity obsession (October 18, 2017). I have updated that analysis using the latest ONS data available – HERE. The following graph shows UK Whole economy output per hour worked from the first-quarter 1975 to the December-quarter 2017. The same sort of pattern emerges if we use the output per person employed measure. The cyclical swings throughout this extended period are evident and the size of the GFC downturn is obvious. The point is that British labour productivity growth slumped during the GFC, and, then has stalled as a result of the austerity that was imposed in the aftermath of the recession. The slump pre-dates, by some years, the Brexit referendum, despite what the ‘Remain Cheer Squad’ would have you believe. Further, in recent quarters, British productivity has actually been rising steadily and has consistently done so since the June 2016 Referendum, albeit at a modest rate. Structural explanations of this slump are also unlikely to have traction. 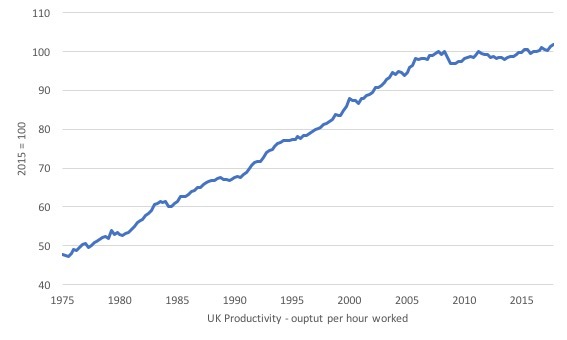 The massive cyclical contraction pushed British productivity growth of its past trend. Structural factors work more slowly and we would not witness such a fall if they were implicated. 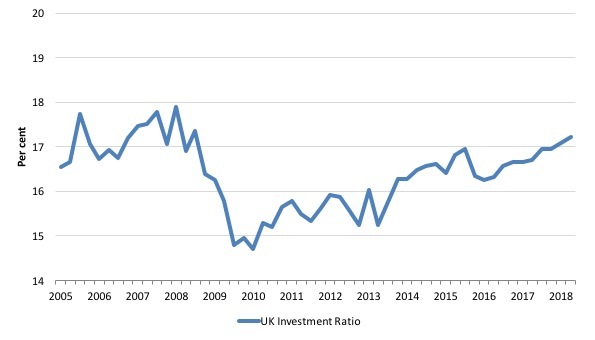 The next graph shows the UK investment ratio (total capital formation as a percent of GDP) from the March-quarter 2005 to the December-quarter 2017. The drop associated with the GFC is quite stunning. It went from 17.9 per cent of GDP in the December-quarter 2007 to 14.7 per cent by the December-quarter 2009. That huge cyclical swing tells us how deep the GFC recession was in the UK. Why would that cause productivity growth to slump then fail to recover? A major driver of productivity is investment – both public and private. While business investment is cost sensitive (so may respond to interest rate changes), mainstream economists usually ignore the fact that expectations of earnings are also important as are asymmetries across the cycle. Cyclical asymmetries mean (in this context) that investment spending drops quickly when economic activity declines and typically takes a longer period to recover. So fast drop and slow recovery. The cyclical asymmetries in investment spending arise because investment in new capital stock usually requires firms to make large irreversible capital outlays. I discussed that phenomenon in detail in the blog post (cited above) – British productivity slump – all down to George Osborne’s austerity obsession (October 18, 2017) – which gives additional references. The point is that when the economy experiences a sharp contraction, there is a necessity for strong fiscal support to rebuild confidence among firms that it will be worthwhile investing in new capacity. Exactly the opposite happened in the UK with George Osborne pursuing his ideological obsession for fiscal surpluses (and failing). Imposing pro-cyclical fiscal austerity of the scale that George Osborne initiated when the Tories came took government in May 2010 is the last thing a government should do when non-government spending is in retreat. Fiscal austerity in these circumstances exacerbates the typical asymmetry associated with investment expenditure and is a major reason why business investment in the UK has been so weak. We often focus on the short-term negative impacts of fiscal austerity, but in this case, it also has serious long-term impacts on both the rate of business investment and the potential growth rate (which falls as capital formation stalls). The longer it takes for business investment to recover, the worse will be the long-term impact on potential GDP growth. In turn, this means that the inflation biases are increased because full capacity is reached sooner in a recovery – often before all the idle labour is absorbed. So, while George Osborne is long gone, the negative impacts of his policy folly will reverberate for a long time to come. His failings will continue on for many years and the flat productivity growth is one manifestation of that failing. And, in the context of what I consider to be a false association with the Brexit vote, the Investment ratio has consistently been rising since June 2016. It was 16.6 per cent of GDP then and the latest estimate is 17.2 per cent (March-quarter 2018). So again it is curious to me that the UK Guardian would think it appropriate to put this sort of commentary under ‘Brexit Watch’ rather than being a general commentary on the data release. Well not really curious. I think it is obvious given that the Guardian has been leading the charge with its anti-Brexit message. But one gets a vastly different narrative when reading the recent New York Times article, which I discuss below. I wrote about the British National Health Service recently in this blog post – The British NHS debate – TINA but only if you believe in nonsense (May 28, 2018). I have also been studying local government funding arrangements in the UK and the changes in fiscal fortunes under the Tory austerity for local authorities is nothing short of stunning. UK local government’s spending as a share of the economy is falling sharply. In 2010/11, UK local government’s current expenditure accounted for 8.4 per cent of the economy. By 2015/16, it had fallen to 6.7 per cent. By 2021/22, it will be down to 5.7 per cent. Overall, English local authorities will have seen reductions of £16 billion to core central government funding during the course of this decade.10 By 2019/20, more than half of all English councils, including three quarters of district councils, will no longer receive the revenue support grant. They will also have to pay the Government a contribution from their other income. According to the data in the – The Local Government Finance Report (England) 2018 to 2019 (released February 20, 2018) – the Revenue Support Grant from the central government for financial year 2018/2019 was £3,573,308,349. The previous year’s publication shows the Revenue Support Grant was £4,981,793,727. That is a 28 per cent cut in nominal terms and higher in real terms. The Revenue Support Grant is the core central funding for local councils in Britain. Taking a longer term view, the LGA say that the Revenue Support Grant (on current estimates) will have shrunk by 77 per cent between 2015 and 2020. In the financial year 2015/16, the Revenue Support Grant was £9.9 billion and that will fall to £2.2 billion by 2019/20. By the 2019/20 fiscal year, around half of all councils (168) will receive no core central government funding. So roads will deteriorate further, parks and gardens will decline, street lights will be darkened and essential services such as museums, leisure areas, libraries etc will be severely compromised. If one is looking for reasons for the relatively poor performance of the British economy a good starting place is not the Brexit uncertainty but the hard pounds and pence that have been taken out of local areas by the central government austerity. And, surprisingly, the New York Times article cited in the Introduction – In Britain, Austerity Is Changing Everything (May 28, 2018) – seems to get all this much more than the British commentary, which is obsessed with the ‘If it is bad it is Brexit’ narrative. The NYTs author, American Peter S. Goodman – explored the landscape of regional Britain to research his article. He didn’t draw fancy graphs showing how many bankers ‘plan’ to move from the city of London elsewhere – ‘because of Brexit’ – although if these proposed migrations are due to ‘Brexit’ then we might redefine the narrative to be ‘if it is good, it is because of Brexit’. For those graphs see Frankfurt Is the Big Winner in Battle for Brexit Bankers (April 18, 2018). … as the local government desperately seeks to turn assets into cash, Browns Field, a lush park in the center of town, may be doomed, too. At a meeting in November, the council included it on a list of 17 parks to sell to developers. That is not Brexit. That is unnecessary austerity. For a nation with a storied history of public largess, the protracted campaign of budget cutting, started in 2010 by a government led by the Conservative Party, has delivered a monumental shift in British life. A wave of austerity has yielded a country that has grown accustomed to living with less, even as many measures of social well-being — crime rates, opioid addiction, infant mortality, childhood poverty and homelessness — point to a deteriorating quality of life. 1. “By 2020, reductions already set in motion will produce cuts to British social welfare programs exceeding $36 billion a year compared with a decade earlier, or more than $900 annually for every working-age person in the country”. 2. “The government has created destitution”. 3. “At public libraries, volunteers now outnumber paid staff … this is akin to setting your house on fire and then reveling in the community spirit as neighbors come running to help extinguish the blaze”. 4. Quoting a Conservative MP (from 2011): “We are making cuts that I think Margaret Thatcher, back in the 1980s, could only have dreamt of”. 5. “British austerity has been a slow bleed, though the cumulative toll has been substantial”. 6. “spending on police forces has dropped 17 percent since 2010, while the number of police officers has dropped 14 percent”. 7. “The national court system has eliminated nearly a third of its staff”. 8. “The number of elderly people receiving government-furnished care that enables them to remain in their homes has fallen by roughly a quarter”. 9. “last year Britain finally produced a modest budget surplus”. This the main game in Britain – and the concentration of the ‘Remainers’, particularly those on the Left, many of whom have secure and well-paid jobs, on ‘Brexit is Bad’ has diverted attention away from the long-term damage that austerity and obsessions with fiscal surpluses is causing. The constant parade of commentaries from so-called ‘progressives’ about the disasters of Brexit in the popular press dwarfs the articles from the same camp about the long term austerity impacts. What is happening in Britain now is mostly the result of nearly a decade of poorly contrived macroeconomic policy and has little to do with what happened in June 2016 when the British people exercised their democratic right and made a sound judgement to get out of the dysfunctional, corporatist mess that the European Union has become. Whether Brexit turns out to be a bad thing for the UK will not be the result of severing ties with the corrupt and dysfunctional European Union. It will all be down to the policy positions that the British government takes. Both major political parties in Britain have expressed nonsensical views about the need to run fiscal surpluses. If it persists with this neoliberal obsession of pursuing fiscal surpluses, then the outcomes are likely to be bad. If not, otherwise. For British Labour, the choice is clear. Right now, given the non-government spending behaviour, the record levels of debt being carried by households, the external deficit, and the badly hollowed out public service capacity (documented by the New York Times article discussed above), the fiscal position should be in deficit not balanced or in surplus. If the British Labour Party continues to rave on about fiscal rules (as if they define responsible policy) they will just perpetuate the Tory mess. The Labour Party should show leadership and publicly recognise the intrinsic capacities the British government has as the currency-issuer to create strong employment growth and first-class public infrastructure – both of which crowd in private investment. And the UK Guardian should be more circumspect in what it posts in its ‘Brexit Watch’ column. Goodman found a GP who seemingly understood the nub of the dynamic of austerity. This NYT article got huge traction across social media. Hopefully through the UK as well. One would think the Guardian would be capable of doing such a piece at least monthly. Thanks for this timely article Bill. What’s even worse about these draconian cuts in central government support grants initiated by Osborne, is that, as local services decline and public squalor proliferates, the blame gets put on the local authorities themselves, often Labour-led in areas of greater deprivation, rather than on Tory central government parsimony. That’s the added, deliberate, evil genius of Osborne’s policy. And the blame game on local authorities is also accompanied by the Brexit claims which further divert attention away from the austerity. If investment is down it must be Brexit rather than years of austerity and suppressed aggregate spending. That is why I wrote the blog post. Blanchflower was (and for all I know still is) one of the set of \”wise men\” (Piketty was another but I believe he never actually enlisted) coralled by Corbyn\’s #2 (and shadow Chancellor/finance minister McDonnell) to help framing Labour\’s new, progressive, macroeconomic policy. As such he was I believe largely instrumental in concocting the formula whereby Labour gave the appearance of pledging itself to the achievement of a \”balanced budget\” (!) while providing a \”get-out clause\” the intention of which was to convey the subliminal message \”but we don\’t really mean that\” (\”nudge, nudge …wink, wink\” in Monty Python parlance). Simon Wren-Lewis was another of the usual suspects involved in that dodgy exercise. The mendacity displayed in the Guardian article you quote from seems to be par for the course. And the Guardian\’s editorial policy is of course enthusiastically and knowingly facilitating it. I begin to think there are no limits to the depths of falsification to which the pathological symptoms of visceral anti-Brexit hatred will not cause these sectarians to sink. It seems that (to paraphrase) \”Hell hath no fury like a (self-appointed) oracle scorned\”- and scorned by the *unwashed*, quelle horreur. All of this is going to create, as in Italy, a toxic legacy of bitterness and recrimination which will take us decades to recover from. What demons these people risk unleashing as they willfully cast aside all moderation, never mind the dictates of ordinary commonsense! Blanchflower was (and for all I know still is) one of the set of “wise men” (Piketty was another but I believe he never actually enlisted) coralled by Corbyn’s #2 (and shadow Chancellor/finance minister McDonnell) to help framing Labour’s new, progressive, macroeconomic policy. As such he was I believe largely instrumental in concocting the formula whereby Labour gave the appearance of pledging itself to the achievement of a “balanced budget” (!) while providing a “get-out clause” the intention of which was to convey the subliminal message “but we don’t really mean that” (“nudge, nudge …wink, wink” Monty Python style). Simon Wren-Lewis was another of the usual suspects involved in that dodgy exercise. The mendacity displayed in the Guardian article you quote from seems to be par for the course. And the Guardian’s editorial policy is of course enthusiastically and knowingly facilitating it. I begin to think there are no limits to the depths of falsification to which the pathological symptoms of visceral anti-Brexit hatred will not cause these sectarians to sink. It seems that (to paraphrase) “Hell hath no fury like a (self-appointed) oracle scorned”- and scorned by the *unwashed*, quelle horreur. To a once-committed Guardian reader like me their cynicism is very disappointing. Sadly it sits alongside their contempt for the working classes. I’m sure it wasn’t always this way. Reading the Blanchflower piece it is broadly a commentary on the state of the UK economy with limited attempt at ascribing causes. The only quasi-adult references to Brexit are that “firms are not going to invest when they have no idea what form Brexit will take” and “Carney said that the UK economy was as much as 2% smaller… due to Brexit”. But the article also mentions “continuing and reckless austerity” and “real wages [that] are still 6.5% below where they were in February 2008”. How convenient then for the editorial team that after raising the Global Financial Crisis, 8 years of Tory economic policy and a referendum held 2 years ago, Blanchflower’s simple, blunt conclusion about the causes of the UK’s economic malaise was “Brexit is a disaster”. How fortunate that this contextually peculiar line gave them the headline they wanted. I doubt they explicitly asked for it, but I’m sure Blanchflower was smart enough to understand the aim of the game. He will be invited back. This applies to a lesser extent to the accompanying comment by Andrew Sentance (Blanchflower’s piece was given priority, presumably for that reason). Sentance is more circumspect, but he does manage to throw in: “If Brexit causes [something, something else bad may continue to happen].” And note that this rather awkward throwaway line was given prominence with a paragraph of its own. If you come to Oxfordshire (one of the richest counties) you will find the general state of the roads an absolute disgrace for a supposedly advanced country. Even David Cameron’s mother (an Oxfordshire resident – Cameron used to be an MP for a seat in Oxfordshire) complained about the cuts to local government funding (and this was well before the referendum). (She’s hardly a progressive though – she dished out prison sentences to Greenham Common protesters when she was a magistrate). Roads are just one thing, but the infrastructure is rotting to the core. Thank you Cameron; thank you Osborne, oh and thank you Liberal Democrats who allowed this foul pestilence to remain in government for 5 years during the unlamented coalition period. My theory is that a recession is being engineered to create a crisis and a 2nd referendum that results in a remain result. The recession will be caused by austerity but blamed on brexit. This is a good analysis of the propaganda war. My fear is that the EU will turn Brexit into such a bureaucratic nightmare (the movement of good across Irish border with Ulster is a clear flash point) that in the end the British will decide Brexit is simply too hard to implement and just give up on the idea.